Brian C. writes: There is a set of 1916-1945 Mercury Dimes available on ebay. The person who put this collection online (me) didn’t know enough about coin collecting to check out the individual coins. The set includes a 1942/1 overdate Mercury Dime, making the set more valuable. The bid is currently fairly low for the set, especially with the overdate. The coin in your image is not a 42/1 die error. The coin shown looks like a damaged last digit caused by a counting machine. 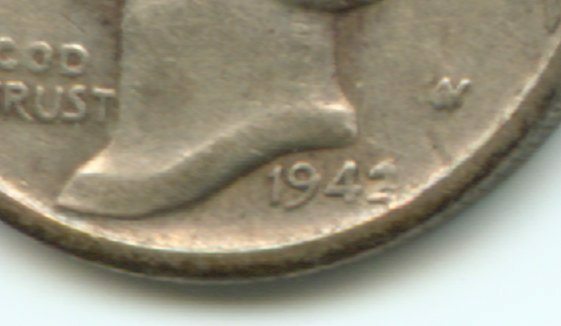 Genuine 42/1 -P dimes show the “1” to the left of the “2” where the two is connected to the “1” making the date look almost like “19412”. See the image below of a genuine 1942/1 Mercury dime. Victoria S. writes: I have a quarter that has a dime head stamped over the quarter head. What is the value of this coin? I also have a double faced dollar bill. It has the presidents head on both sides. What is the value of this dollar? A dime struck on a quarter is physically impossible considering that the quarter would be too big to fit in a press set up to strike dimes. You most likely have a dime struck INTO a quarter. This is done with two blocks of wood, a dime and a quarter. 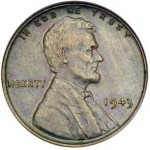 The dime is pressed into the quarter by either using a vice or a mallet. The image of the dime is impressed into the quarter. The image of the dime is retrograde (backwards). Your “double headed” dollar note is most likely an “offset error”. Please see What’s My Paper Money Error Worth? for an explanation, prices and images of offsets and other paper money errors. There is also a simulated “error” with no part of the reverse design visible. This is created by pasting two one dollar notes together back to back. 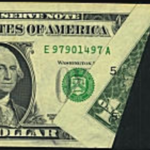 1) Have you heard of any 1963 series United States Notes $5.00 denomination with a yellow seal? 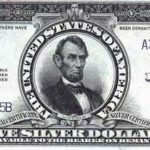 2) Have you heard of any bicentennial half dollars (silver clad – no mint mark) from the Philadelphia mint? 1. Yes, this is done by treating the note with bleach. Sorry, no cigar. 2. U.S. coins prior to 1981 do not have a Mint mark if they were struck at the Philadelphia Mint (an exception is the War Nickels from 1942-1945). Why is my 1883 Indian cent stamped 1888? Sasha O. writes: Hi there, I found this indian head penny in a roll my mother gave me. This one is unusual because of the 1888 stamp on it. Can you tell me what is it’s significance and/or value? This was stamped with the number “1888” by someone outside the Mint, that is, it is not a mint error. 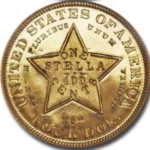 Stamped coins were often used for advertising purposes or as, for example, a hat or coat check token. 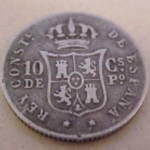 There might have been many tokenized coins with different numbers to signify a specific place in a coat room where a hat or coat was stored. The recipient would return the token and redeem his/her clothing when one left the establishment. Of course, this is just speculation. This kind of alteration goes under the heading of “Exonumia” and if one could identify its exact use, it would sell for $15 or so. Why does my 1996 $20 bill have strange colors? Jeff N. I have a 1996 Twenty Dollar bill with an oddity. On the face of the bill, the serial number on the right is green, while the serial number and treasury seal on the left are blue. The bill face is also white compared to the typical green/black tint on all bills I have compared it to. Is this a common oddity or do I have a bill I could sell to a collector? It sounds like someone laundered their clothes and left their money in the pocket. I like to wash my money in Cheer with a tad of bleach. It brings out those colors just right! Sue P. writes: I have what I think is a token from the state of Missouri. It has the imprint of the state of Missouri in the middle, with a number 1 inside the state. The words: “Missouri Sales Tax Receipt” surrounds the coin. Do you know when this token was issued, and what people did with them? I can’t imagine the entire state of Missouri turning these in to Uncle Sam at tax time, as proof of tax! Thanks so much for your time. Because cents were valuable in the Depression years of the 1930’s, some States issued sales tax tokens either in fractions of a cent or mills (1 mil=1000th of a cent). Since Sales tax would be exact and there were no fractional cents to give change, the final price of an item was rounded up and the difference paid back to the customer in sales tax tokens. These tokens could be used to pay all or part of any sales tax at the time of another purchase. S.H. writes: I have purchased a 1932-D Washington Quarter in VF condition. The mint mark actually looks somewhat like an “S”. I am told by the seller that it is actually a “D”, and that all real 1932-D quarters have the “filled mint mark”, unlike a 1944-D or 1964-D. Is this correct? Genuine 1932-D Washington Quarters have distinct serifs with die polishing under the mint mark. The inside of the “D” is often filled but the outside serifs are usually visible giving the mint mark a rather square, blob like appearance. Since the mint mark sits in a depression on this coin, the “D” is easily discernable even in low grades. I suggest having any 32-D quarter authenticated by a third party grading service, especially if you have no training in counterfeit detection. See the CoinSite Links page for links to NGC, PCGS or ANACS for more information.